The AHCA would force new moms on Medicaid to find work 60 days after labor. 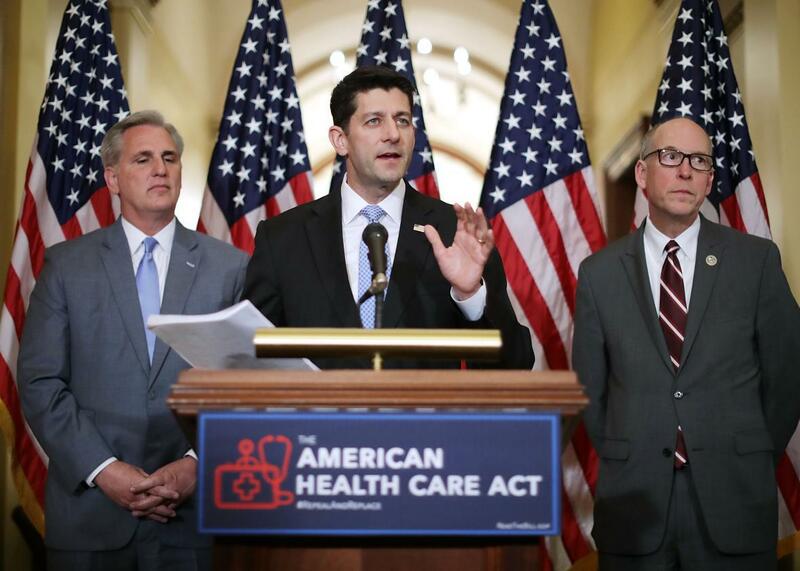 Speaker of the House Paul Ryan presents the disastrous American Health Care Act on March 7, 2017. On Monday night, Paul Ryan attempted to lure more of his far-right Republican compadres on board with the GOP’s proposed health care plan with a set of changes to the bill. The so-called “manager’s amendment” makes the American Health Care Act a significantly more conservative proposal that would mean severe cuts to coverage for the poorest Americans. The AHCA, which would replace the Affordable Care Act, already represented a sweeping rollback of women’s health care coverage—it effectively dismantles all insurance coverage for abortion; eliminates requirements of essential services to be covered under Medicaid; and defunds Planned Parenthood, a move 75 percent of Americans oppose. Monday’s amendment goes even further to restrict women’s access to lifesaving care, particularly if they’re unemployed. Health Affairs has a good, detailed description of how the amendment slashes coverage standards for people on Medicaid in general and children in particular, who make up a disproportionate chunk of Medicaid enrollees. The worst provision in the manager’s amendment is a Medicaid work requirement that would allow states to revoke Medicaid coverage from new mothers who haven’t found a job within two months after giving birth. Medicaid currently offers essential resources for low-income women and their children, including screenings for postpartum depression, in-home educational visits, and check-ups, all of which help babies survive and mothers thrive. Forcing women to job hunt in the weeks immediately following her baby’s delivery—a crucial period for infant care and physical recovery—would be both shockingly cruel and counterproductive as public health policy. Even if Republicans don’t believe that every person deserves basic health care, regardless of income, they should recognize that the government has an interest in keeping children healthy. Healthy children become good students, responsible citizens, and productive workers. Cutting off health benefits from a mother in the first several weeks of her infant’s life sets both the mother and the infant up for a cascading set of impediments to physical and financial health. This proposal is astoundingly hypocritical, even by GOP standards. The party likes to make itself out to be a friend to fetuses by forcing women to give birth, but it keeps legislating policies that make motherhood a punishing prospect for all but the wealthiest women. With the manager’s amendment, the AHCA would make new mothers choose between taking care of their children and keeping their health care, a knot of psychic and financial stress no one should have to bear on top of the stress of new parenthood. The Medicaid work requirement is especially galling in light of Ivanka Trump’s recent efforts to paint herself as a reasonable, centrist bridge-builder on issues of paid family leave and affordable child care. If she and her father truly believe in making it easier for women and families to care for young children, they should come out as vocal opponents of this bill, which could force women to spend the first few weeks of their infants’ lives looking for work.